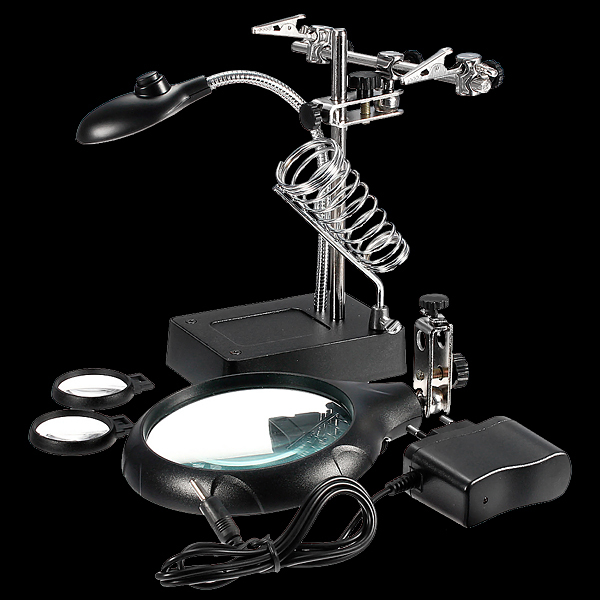 An incredibly useful tool with interchangeable adjustable auxiliary lenses and 3 magnification lenses. An independant illuminating LED light is installed on a flexible metal tube, the distance and angle of the light can be manually adjusted. Support clamps and alligator clips are also adjustable; it is an ideal tool where a third hand is required! The surface of the base is padded with a steel sheet to add weight and reinforce stability. It is powered by an external power adapter or 3 AA batteries (not included).